Set at the main entrance to Opera, The Pastry Boutique will catch your eye with sumptuous cakes, sweets and pastries baked fresh with natural and local ingredients. For those who are looking for exclusive pastry gifts and seasonal sweets, The Pastry Boutique offers beautifully packaged delights for you to take home. Our host will contact you within 24 hours for a confirmation of your request. Many believe that the 'croissant' was invented by the French, but in reality its origins were in Austria, from a specialty called Kipfel. The French queen during the Revolution was not French-born; she arrived in France at age 15 from Austria. Legend has it that she so missed the Kipfel that she requested royal bakers attempt a version. They called it “croissant” and made it look more exquisite for royal dining. Croissants are simple pastries without filling, so their quality depends totally on the quality of the dough. Come and taste the traditional croissant in Opera (also available for take-away from our Pastry Boutique)! Born and raised with homemade cakes by his mom, Chef Tien developed a passion for pastry since a very young age. Years later, Chef Tien challenged himself for the career that he had dreamed about before - baking cakes. 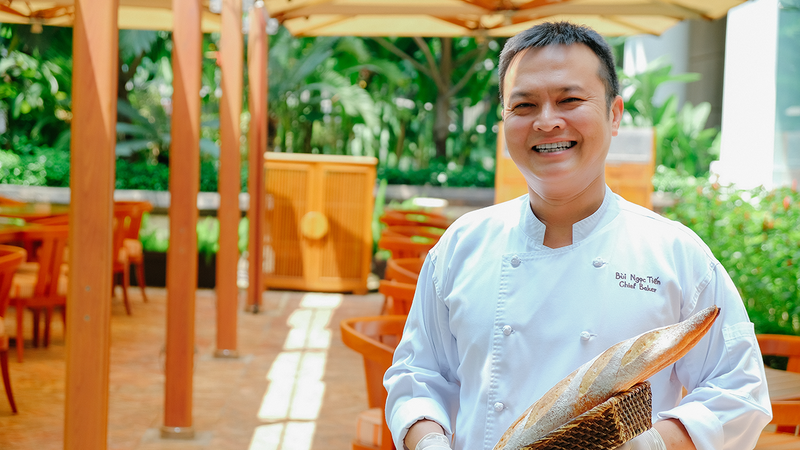 After 24 years working as a pastry Chef and 13 years at Park Hyatt Saigon, Chef Tien is still in love with what he is doing every day. "It was the best time of my life working as a pastry chef. I love to create new cakes and see how guests enjoy them", said Tien. Designed for lovebirds in the month of love, the Valentine's Day sweet collection by Chef Narae and her team is now available at The Pastry Boutique. A wide range of Sakura peach, Progress, Tiramisu with creative touch of Valentine as well as heart-shaped chocolate bonbon is ideal for special gift of love for your sweetheart.